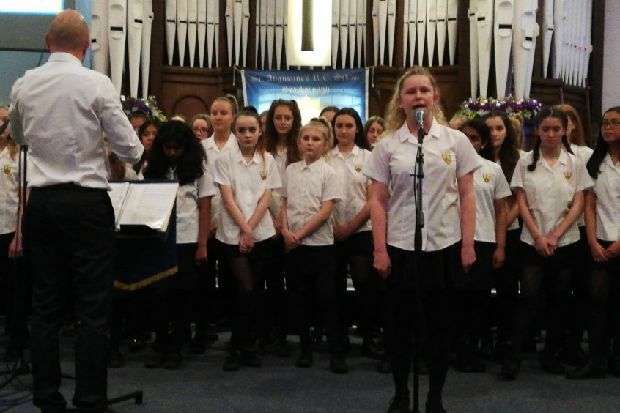 The St Augustine’s Easter Concert recently took place in front of a full house at Westborough Methodist Church. It featured all the school ensembles: Orchestra, Junior Jazz Orchestra, SAJO, Junior Choir, Male Voice Choir and the Senior Choir. Also taking part was the St Peter’s Primary School Orchestra who played Rock Around The Clock. More than a third of the school took part, nearly 200 pupils, in one of the ensembles with many ex-pupils coming back to play and sing which made it a really special evening of performances. The Jazz Orchestra also played an arrangement of Bohemian Rhapsody which was truly outstanding. Local news provided by The Scarborough News. ©2019 FB All Rights Reserved.